This article explains what each field is and does under the banking tab in system setup. The Banking section is used to set your bank account information, which will display on your invoice footer & AutoPay form (unless you complete the AutoPay Banking section; described below). You can also reference these fields from any Notice. Direct Debit Export is used to set whether you want Direct Debits to be exported to your bank for processing. Note: This feature is only supported in New Zealand and only by ANZ, BNZ, ASB & National Bank. Furthermore, the Direct Debit Auth. No is only required when exporting to BNZ. Enter details into the AutoPay Banking section if you want to display different banking details (ie: those in the Banking section) on your AutoPay forms. 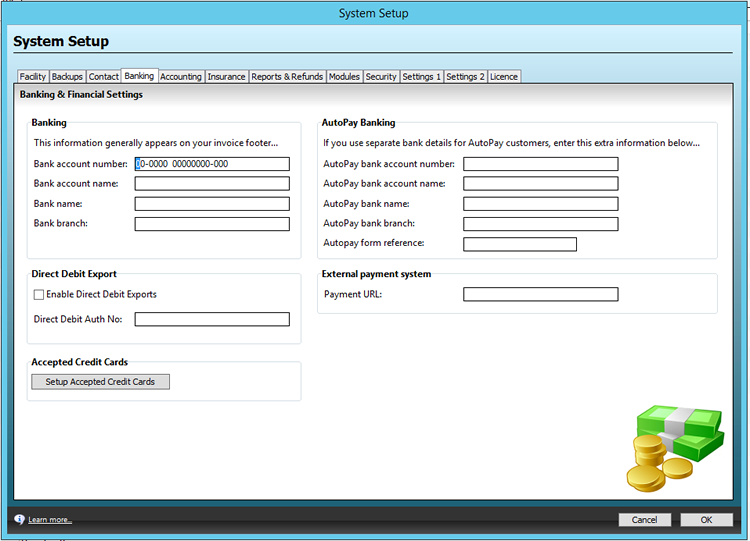 AutoPay forms can be generated from the AutoPay tab on Agreements & Reservations. Enter a URL into the External payment system section if you process payments via 3rd-party website, such as PayPal. If you enter a URL here, an additional button (titled Open Web Page) will appear on the Transactions tab of all Agreements and Other Credit Sales.